Sending-off of the children at the Indonesian Consulate of Tawau. TAWAU: The Indonesian Consulate (KRI) of Tawau yesterday sent off 100 Indonesian children who will continue their education in Indonesia. The children are alumni of Community Learning Center (CLC) who will continue their high school level in Indonesia through the “Sabah Bridge” scholarship program and self-help (self-funding) program. 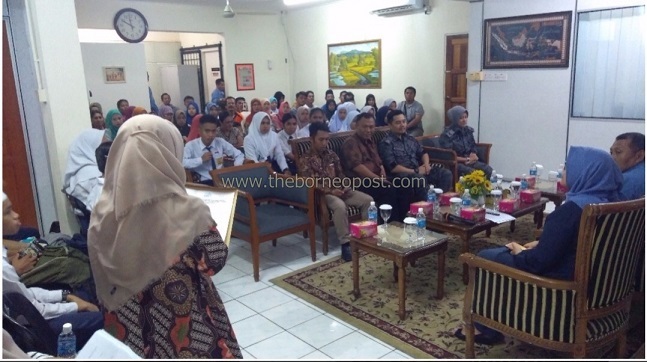 Tawau KRI consulate general Sulistijo Djati Ismojo said present at the event were representatives from the Tawau Immigration Department, parents, companion teachers, Sabah Bridge activist teachers and students who would leave for Indonesia. Coordinator of Sabah Bridge, Mr Aksar, reported that Sabah Bridge, the Indonesian governmental messenger movement, cooperated with KRI Tawau and KJRI Kota Kinabalu this year to facilitate the return of 100 children (65 on scholarship) to Java, Sulawesi and Sumatra region and 135 children to Nunukan and Sebatik to continue their schooling. Mohammad Rizal, representative of the Tawau Immigration Department, congratulated the participants and explained that it would always support such activities in particular with regard to the administration required for the crossing process so that they can use the legal channels. Djati appreciated the students, teachers and parents who were managing legitimate travel documents for their children to return to Indonesia and not by risky and dangerous illegal means.